Anti aging and skin care oils can benefit skin in many areas. Using pure botanical oils in your beauty care regimen is an effective way to get the natural plant oils phytochemicals to help defend against aging, free-radical damage. Plant oils have the natural ability to absorb easily into the skin to nourish the deeper skin layers to help regenerate connective tissue to stimulate collagen and elastin protein. Increasing skin elasticity will result in a more firm, plumper, younger-looking facial form. There is a huge amount of oils that can be used for anti aging and skin care. Many can be personalized especially to your own needs and chosen to target many areas of the skin and help enhance, correct, and prevent many skin issues. Herbal and botanical oils can be of great importance for acne-prone skin. They can provide the gentle, yet very protective attention that sensitive, inflamed skin needs. Such oils like Ginger root, Aloe vera, and Chamomile flower infused oil can inhibit bacteria growth, reducing inflammation, calm and replenish. Some oils such as Apricot kernel, Argan, Macadamia nut, and Pomegranate seed are especially useful for dry, dull or mature skin types to improve elasticity, strengthen, regenerate, and keep skin hydrated. Look for plant-derived (herbs, roots, flowers, fruits, leaves,seeds,or other plant part) (Botanical) ingredients. 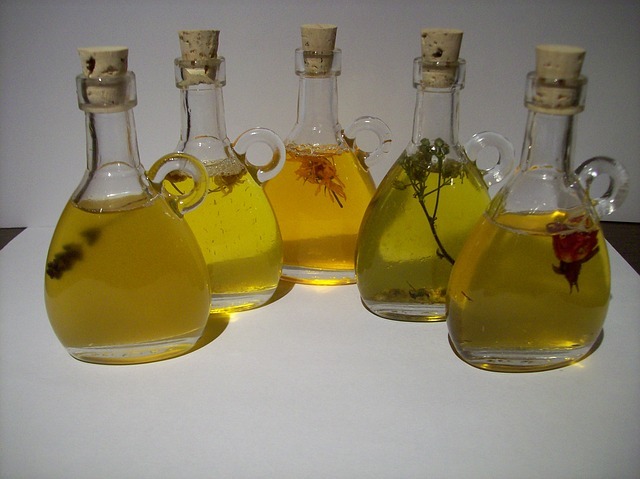 The seeds of this yellow wild flower are cold pressed to extract this valuable oil. A thin textured oil of a sweet and light aroma that is rich in omega-6 fatty acids including GLA (gamma-linoleic acid) which helps to enhance the epidermal barrier. It’s high level of antioxidants make it ideal in anti aging preparations. It helps to hydrate and smooth the complexion,helping to reduce the appearance of fine lines and wrinkles. Primrose Oil has been known for its long history of medicinal uses. Its anti-inflammatory properties is useful for many skin-related problems such as acne. It can also be used as a supplement to offer many anti aging benefits to the body. This light weight nutty oil is very similar to human sebum making it the perfect choice beauty treatment that has great penetration abilities. It’s high fatty acid profile provides regenerating and moisturizing properties to support our skin’ cellular structure and help retain moisture. Its high Phytosterol content also help support,heal,and protect our cellular membrane. A great topical oil that is perfect for mature skin types to slow down and help remove signs of aging. This amazing oil can also boost your internal health. Treat yourself to dark chocolate covered Macadamia Nuts! This antioxidant-rich beauty oil has been incorporated into many anti aging skin care products to help keep skin smooth, soft ,and flawless. Natural antioxidants such as Vitamin C,A E &K maintain healthy skin by helping to protect attack by harmful free radicals, keeping skin revitalized and rejuvenated. The high level of punicic acid of the oil hydrates and helps prevent moisture loss. Punicic acid is an omega 5 fatty acid that also protects the skin from sun damage which can lead to elastin breakdown and wrinkle formation. It effectively helps boost our collagen and elastin production, enhancing elasticity to strengthen connective tissue,firm and support the inner and outer layers of skin. The anti-inflammatory properties help ease skin irritations and redness, aiding in tissue repair and healing the skin which is ideal for acne/oily prone skin sufferers. Apricot Kernel Oil for anti aging and skin care- A Vitamin high in A,B ,C and other beneficial minerals is an enriched oil that is easily absorbed to help moisturize, soften and help slow down the signs of aging. It is a light oil that lubricates without leaving an oily residue with moisturizing and nourishing properties. It's often used as a carrier oil in aromatherapy massage treatments to help rejuvenate sore muscles and revitalize our body and senses. It can be very beneficial to a dry or mature skin type. Known for its gentle and mild nature it is well tolerated by all types, even the most sensitive skin and acne-prone. It’s high content of Linoleic Acid (A Omega-6 fatty acid) it carries helps keep your skin maintain its moisture balance,improve blood flow and increase skin’ turnover rate. Known for its popularity for centuries in China and Japan for its amazing essential fatty acid compositions that give beautifying benefits to skin and hair. The oil is obtained from the seeds of a winter/spring blooming flower native to Japan and North China. It has a very light consistency that has a similar composition to human fatty acids that absorb fast and is able to penetrate deep down into the lower layers of skin, leaving skin supple and hydrated. The rich amount of oleic acid and high amounts of Vitamin A,B,C & E help nourish and protect against premature aging. It nourishes cell membranes, replenishes moisture, rejuvenates, and accelerates cell turnover. Camellia oil protects skin from environmental damage that can cause excessive pigmentation,wrinkles,and lines. Many anti aging and skin care benefits can be achieved through using personal care products that are as close to nature as possible.